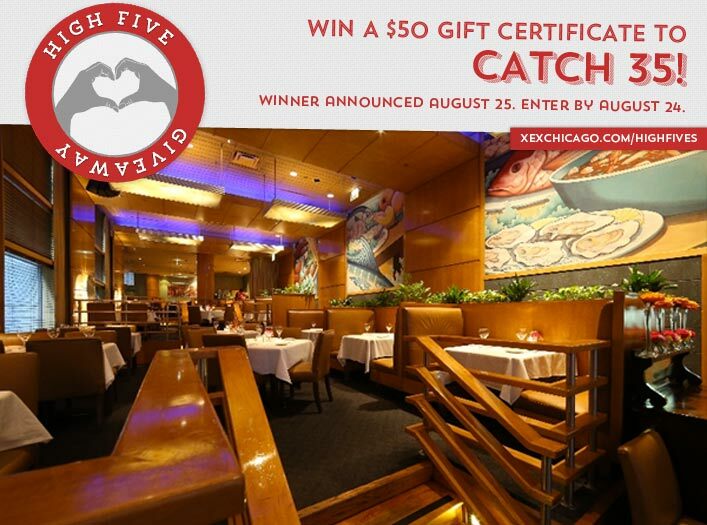 Win a $50 Gift Certificate to Catch 35! Congratulations to Alecia Taylor on winning our 133rd High Five Giveaway and thank you to all who entered! Our next High Five Giveaway is for a $50 gift certificate to Catch 35. There’s a Catch-22 situation at Catch 35. The dilemma is the menu. The range of seafood choices is so deep and interesting that you get the feeling you should pull up a deck chair to aid further study. Variety, appeal, flavor – Catch 35 has quietly and steadfastly fashioned itself into one of the top seafood restaurants in Chicago. Catch 35 is located at 35 W Wacker Drive (same building as XEX), Chicago. Their phone number is 312-346-3500. Visit their website at www.catch35.com. What Aveda product line is great for guys looking to keep their hair healthy? Now, just add a comment to this post with the right answer to be eligible to win! The winner will be announced on Tuesday, August 25. Entries must be received by midnight on Monday, August 24. Aveda’s Pure-Formance line is great for guys looking to keep their hair healthy!! Aveda’s Pure-Formance line is it!